Bezoeker wordt 1 x p/d geteld. Crower 5 plaats 12½ inch per motor. Firestone HP 2000 Puller banden. 40 liter in 12 seconden [per trek]. The Development of The Rolls-Royce Griffon. The Griffon was initially developed at the request of the British Navy, the Fleet Air Arm or FAA. Navy aircraft tend to be larger and heavier than their land based counterparts, which obviously puts greater demand on the engine if performance is to be maintained. To meet this demand Rolls reverted back to the concept of the Schneider Trophy "R" engine. The Griffon, essentially a modernized Merlin was a 60 degree V-12 with 6.0 inch bores and 6.6-inch stroke giving a 2,239 cubic inch displacement, same parameters as the "R". But this was a totally new engine featuring many design updates. Development started in 1939 and compared with the Merlin development went quite smoothly. Several deviations were made from previous Rolls-Royce V-12 practice. The camshaft and magneto drives were taken from the front offering two advantages. Firstly, the critical timing function of the valves and the ignition would not be left to the mercy of the torsional excursions of the crankshaft. Secondly, the length of the engine was reduced, thus satisfying one of the requirements of the Griffon that it should be capable of retrofitting in existing Merlin powered aircraft. The magneto and camshaft drive gears tapped of the propeller reduction gear for their drive requirements along with the starter. Early development Griffons also drove the supercharger from the front via a long quill shaft which ran under the crankshaft. Due to problems, this promising idea was quickly dropped. Instead, the supercharger took it's drive in a similar way to the Merlin via a quill shaft splined into the rear of the crankshaft. 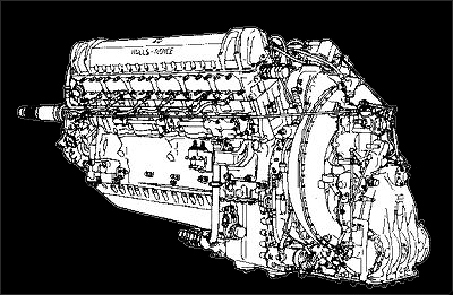 Early engines featured single stage, two speed supercharging again copying Merlin practice but beefed up to take the heavier loads imposed upon it. The crankshaft, also like the Merlin was a 120 degree forged unit supported in seven cross bolted main bearings. However, the firing order was different from the Merlin. A 60 degree V-12 with a 120 crank and paired throws has a number of permutations on ideal firing order, no one being superior to another provided the intake system is "tuned" for the firing order chosen. However, the exhaust note will vary. This gave the Griffon its classic "Griffon Growl" exhaust sound, not as sweet as the Merlin but still impressive!! Different valve timing contributed to the difference in exhaust note. The Griffon had a relatively modest 28 degrees of overlap and 248 degrees of cam duration compared to the Merlin's more radical 43 degrees of overlap and 263 degrees of duration. Later Merlins had 70 degrees of overlap and 288 degrees of duration. A further refinement was made to the propeller reduction gear pinion drive by incorporating a floating ring at the crankshaft end featuring male and female splines. This was an effort to further isolate the pinion gear from the torsional vibration of the crankshaft. After the debacle with the ramp head on the Merlin the Griffon featured the by now ubiquitous and well-proven Kestrel based cylindrical combustion chamber with zero degrees included valve angle. Incorporation of end-to-end crankshaft lubrication was another lesson learned from Merlin experience. Furthermore, this feature proved so successful, all subsequent Rolls-Royce piston engines employed it after it's introduction in the 100 series Merlin. One of the design peculiarities of the Merlin, which dated it to the 1930’s, was the extensive use of external oil lines rather than the more modern internal oil galleries. These external oil lines tended to be maintenance headaches at times being major contributors to oil leaks and the occasional fracture resulting in serious engine damage. By comparison the Griffon was a clean design with few external oil lines. Accessories required for aircraft systems such as electric generators, hydraulic pumps, vacuum pumps etc., took their drive from a remotely mounted gearbox driven from a power take off tapped off the wheelcase. The Merlin on the other hand had accessories cluttering the exterior of the engine with the vacuum pump and propeller governor mounted on the front, the tachometer generator or tachometer drive, air compressor, and hydraulic pump were mounted on the cylinder heads driven off the camshafts. The lower crankcase also offered a drive take off for a hydraulic pump, overall a somewhat disorganized arrangement. Interestingly, the Griffon rotated in the opposite direction to a Merlin. No advantages exist for either direction of rotation. Shoehorning the Griffon into a relatively light single engined aircraft such as the Spitfire created some handling difficulties primarily due to the enormous torque reaction which could amount to a very significant 4,700 pounds feet at take-off power. Designing a gear reduction unit for a contra rotating propeller turned out to the definitive answer after various aerodynamic attempts such as enlarged vertical stabilizer area only presented partial solutions. The 80 series were the first Griffons to receive dual rotating propeller drives and were introduced just prior to the end of World War II. This was accomplished by having two pinions and two reduction gears. The front pinion was of a smaller diameter than the rear and drove an additional idler gear resulting in opposite rotation for the propeller reduction gear. The reduction gears drove co-axial, contra rotating propeller shafts. Contra rotating props were essential for the Navy version of the Griffon Spitfire, known as the Seafire due to the extremely hazardous nature of carrier landings particularly during a go-around when maximum power needed to be applied at low altitude and low air speed. Torque reaction pulled a Griffon Spitfire with a single prop to the right, towards the carrier island, obviously a very s situation. Other internal features of the engine followed Merlin practice. Early Griffons entered service with two speed, single stage superchargers rated at 1,735 hp at 16,000 feet which soon gave way to two speed, two stage superchargers with intercooling and aftercooling, again similar to Merlin practice, rated at 2,350 horsepower which was achieved with the extremely high manifold pressure of 25 psi or 80 inches of mercury. The two speed supercharger shifting was automatic, relying on atmospheric pressure via an aneroid switch to shift to the appropriate blower speed. Centrifugal bob weights mounted on the blower clutches add to the drive capability of the clutches, i.e., the faster it spins, the harder the clutch grabs. 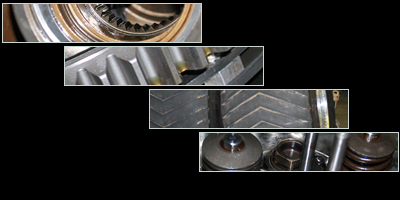 When the blower shifts, a small degree of clutch slip is built in; otherwise the accelerating forces would damage and possibly strip the blower drive gears. The clutches also absorb some of the torsional vibration emanating from the crankshaft, this design feature may help explain why no Rolls-Royce piston engines except for the Eagle 22 last of the piston engine developments required no dynamic crankshaft counter weights. A few examples of the 100 series Griffon were built with three speed, two stage supercharging, the only application being the Supermarine Spiteful, a development of the Spitfire featuring laminar flow wings. The two stage two speed Griffons, the "60" series, were typically rated at 2,375 hp at 1,250 feet in low blower of "M.S." (moderate speed) and 2,130 hp at 15,500 feet in "F.S." (full speed). All horsepower ratings were at 2,750 rpm. Carburation could be via a three-barrel injection carburettor built by Rolls-Royce based on the Bendix injection unit. Alternatively, a single Point Rolls-Royce injection unit based on the speed density principle pioneered in the United States accomplished carburation. Like the Bendix unit, atomized fuel was sprayed into the eye of the first stage impeller. In early 1941, the Focke Wulfe 190 menace appeared over England for the first time. It created havoc with it's superior performance over anything the British could throw against it at the time. Immediately plans were put in place to shoe horn the Griffon into the Spitfire - this was not an easy task. The finished product was a masterpiece of engineering incorporating the state of the art technology for engine installation at that time. From the firewall forward everything was new. The oil tank was relocated from it's previous position under the engine to the firewall. A fabricated sheet aluminium mount, similar in concept to the P-51, replaced the previous chrome moly tabular mount. Three bumps at the front of the cowl accommodated the valve covers and the single large magneto. Due to the much greater heat rejection requirements of the Griffon, the familiar under wing radiators now grew, having far greater depth for additional radiator capacity. Spitfire XII's were the first recipient of the Griffon powered by the Mk. III or IV variants with single stage, two speed supercharging. A number of subsequent Spitfires retained Merlin power but towards the end of Spitfire production all were powered by Griffons. Starting with the Spitfire XIV, two-stage, two-speed intercooled, aftercooled superchargers became standard, all of which were 60 series engines. Designed to Air Ministry Specification F.1/43 and Navy specification N.5/45 as the Seafang. Under development throughout most of World War II the final and ultimate Spitfire variation, the Spiteful along with the Navy derivative, the Seafang, did not see action during World War II. Essentially a brand new design with a lot of Spitfire influence, it was the first Supermarine aircraft to feature lamina flow flying surfaces. Other design refinements included less drag producing, wide slim radiators mounted under the wings and wide track, inwardly retracting landing gear, correcting one of the Spitfires few faults, that of poor ground handling. First flown June 30th. 1944 the new design looked promising although shortly afterwards the prototype was destroyed in an accident, killing the test pilot. This set the program back and finally the Spiteful/Seafang faded away into history with only a small handful of aircraft being built which did not enter squadron service. Initially powered by a Griffon 65, later versions had this engine replaced by a Griffon 85, essentially the same engine but driving a six bladed contra rotating propeller. An interesting footnote is the fact that Spiteful flying surfaces were used as the basis for Supermarines first jet powered aircraft, the Attacker. Back in the early 1940's, one very clever engineer was busy developing a very large version of the famous Vee 12 series of four stroke, petrol, piston engines, that Rolls Royce had become world renowned for. In 1940 A.A. Rubbra had become the Rolls Royce Chief Designer, after joining them in 1925 as an assistant engine tester. Arthur Rubbra, in true RR tradition, used well-tried engineering and the best materials to produce the early versions of the Griffon aeroengine. Today, this is almost sixty years ago, and to many just a bit of distant history, to those born since the late 1950's, it seems of no consequence at all. The actual ancestral line of the Griffon engine runs even further back, to a derated, ( detuned,) version of a very famous RR engine indeed. The first experimental Griffon was about in 1933 and up and running, and was a close relative of the 'R' engine used in the Schneider Cup air races of 1929 and 1930. There was a whole series of Vee 12 RR engines about at this time, and the Griffon version was actually shelved in 1933 to be left in case it was needed in later years. That is exactly what happend, because by 1939 the drawings had been dusted off, and the Griffon Mk 1 ran on the test bed as an experimental engine. By 1942 the Griffon was in production, using the original bore and stroke of the racing 'R' engine, being termed a Griffon Mk 2. It was fitted to the Firefly fighter, and drove a single propeller. The years passed by and the Griffon went through much development and updating, gaining a two-speed supercharger and a contra-rotating propeller for Spitfire and Spiteful use in the Naval carrier role. Fuel injection into the eye of the supercharger came along during the war, and improved the performance. The development followed that of the smaller Merlin Vee 12 aeroengine though behind it; though the Griffon had improvements like end-feed oil lubrication for the crankshaft first. By the time the Griffon found its way into the Shackleton four engined maritime reconnaissance aircraft it was well up the 'mark' range, Mk 54 onto Mk. 54A in fact. So after WW2 by the time the Shackleton was flying with its four Griffons, the engines had been about a long time. In terms of power and performance the contra-rotating propellers were need to absorb all that power, and to keep the prop-disc a reasonable size. Years rolled past, and the Shackleton with its ancient engines became folklore, remaining in use an unprecedented number of years, well past its sell-by date in modern terms. The men and women who serviced and flew it once drove Austin Seven side-valve motor cars, then onto overhead-valve Morris 1000's and Mini's, and ohv Ford Cortina's, onto VW Golfs, then onto Vauxhall/Opel Astra's, to today’s super quiet super-mini's with multi-valve heads, fuel injection, turbos, etc. But wait a minute, the Griffon engine had four valves per cylinder all those years ago, and it had fuel injection, and a supercharger, (a turbo is only an exhaust powered supercharger after all.) Do today’s modern car drivers ever consider that their engine shares so much with the Griffon, in that both have cast aluminium heads/blocks/sumps, four valves per cylinder, fuel injection, nimonic exhaust valve seats and valve head, exhaust valve stems filled with sodium to aid cooling, stellited valve tips to reduce wear, the twin overhead camshafts, engine sections held together with long through bolts, an engine management system, (though the Griffons was mechanical not solid-state,) sealed cooling systems with special anti-corrosive/anti-freeze coolant mixture, anti-interference ignition leads; infact there is only the extra cylinders, the propeller and magneto missing! I wonder if they (you,) do? There is nothing new under the Sun; someone will have tried it sometime, somewhere, somehow. It took your1990's car over 50 years to catch up with the Griffon, first seen in 1933!